The union served notice to Post Office Ltd yesterday (Monday 25 July) for the ballot which will run from 1 August with the result due on 19 August. The ballot is in reaction to the companyâ€™s plans for wholesale privatisation of the crown network and widespread job losses â€“ with 80 Crown post offices announced for closure already this year and up to 2,000 job losses planned across the business. The ballot also covers the companyâ€™s decision to close the defined benefit pension scheme. The closure of over half of the Post Office cash handling operation, whilst exiting the external market (announced April 2016). Last week the CWU took a 20 foot postcard around Scotland, Wales and England collecting thousands of signatures against post offices closures. On Friday it was delivered to the offices of new business secretary Greg Clark. Dave Ward continued: â€œThe governmentâ€™s response on funding has been wanting and misleading â€“ money has been spent on closing down offices and paying off staff instead of bringing new business into the network. The lack of imagination and ambition for this great British institution is staggering. 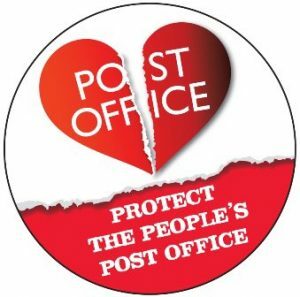 The last strike action by crown post office staff was in December 2013 and the last strike action by supply chain workers was in December 2014.